'Popup Maker' -> 'Settings' -> 'Subscriptions (tab)' -> 'MailChimp (category)'. Set the double opt-in feature for subscription forms linked to a MailChimp account. 'Popup Maker' -> 'Settings' -> 'Subscriptions (tab)' -> 'General (category)'. Set a default newsletter subscriber for a popup subscription form -- By default, the MailChimp Integration plugin extension sets this option to 'MailChimp'. Link a MailChimp account with a Popup Maker subscription form using the MailChimp account API key. 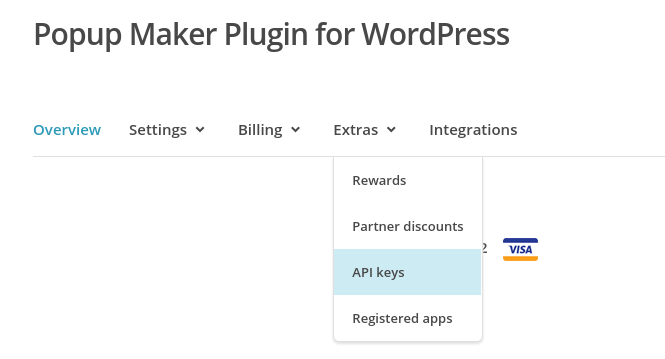 Copy the key from MailChimp and paste it into the MailChimp API Key option field. Open a new browser window or tab and navigate to MailChimp. Log into your MailChimp account. If your MailChimp account does not contain an API key, the table labeled 'Your API Keys' table will likely be empty. Click the 'Create A Key' button below the table. Once the page refreshes, a new API key will display under the 'API Key' column. Copy the entire MailChimp API key. In a separate browser tab, navigate to 'Popup Maker' -> 'Settings' -> 'Subscriptions (tab)' -> 'MailChimp (catagory)'. 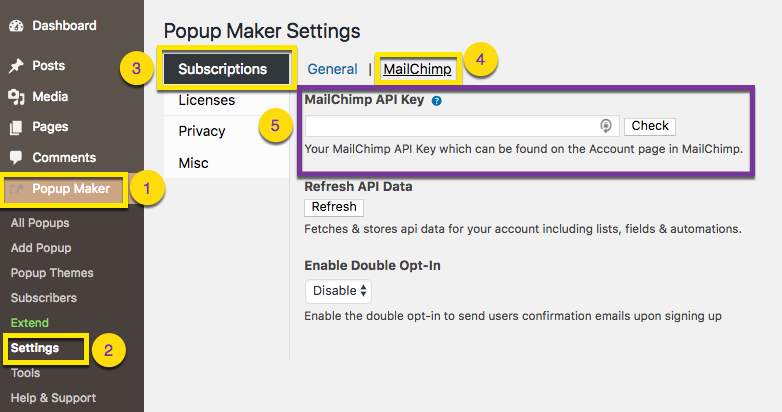 Paste the MailChimp API key into the field labeled 'MailChimp API Key'. Check that the key is valid by selecting the 'Check' button, as shown above. A green check mark indicates the API key is good, and the MailChimp account is linked to Popup Maker. Once a valid API key is entered, select the 'SAVE' button to update the page settings. * = These items must already be set up in the target MailChimp account to be sent. When the 'Refresh' button is selected, Popup Maker calls the MailChimp account via the API key. An animation of 2 rotating arrows will display during the data update. When the API call is complete and the plugin data is refreshed, a check mark will appear next to the button label (see image above). Plugin users can enable 'double opt-in' in their popup subscription forms by choosing the 'Enable' menu option. Visitors who subscribe via a popup form receive an email in which they must confirm their subscription intent. By default, this feature is turned 'off' (set to 'disable'). Turn the feature 'on' by selecting 'enable'.